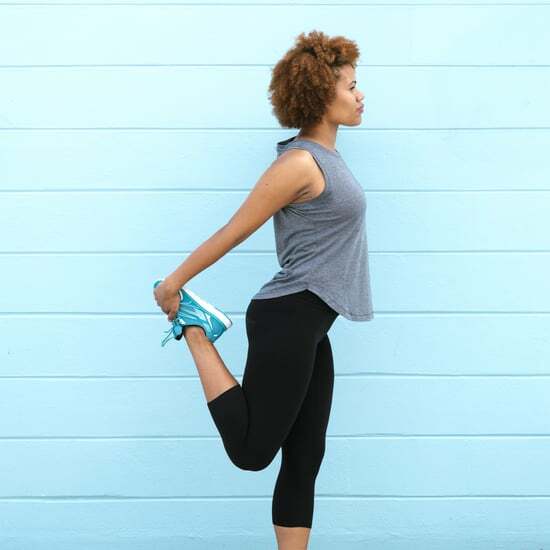 Although yoga poses vary between different types of yoga, Extended Side Angle is a basic standing posture you'll see in most any class you take. This pose strengthens your legs, and makes you feel bold, yet relaxed. We've already tried the variation of this pose known as Twisting Extended Side Angle, so here's another variation you can try. I like this one especially because it opens the shoulders and chest. Begin on your mat in Downward Facing Dog pose. Step your right foot forward between your hands, and rise up into Warrior 1. Open your hips, arms, and chest into Warrior 2 pose. Lower your right shoulder as low as you can in beside your right inner thigh, and reach your right arm underneath your hamstring. Reach your left arm around your lower back, and bind, holding your left wrist with your right hand. Draw your upper shoulder back as far as you can, and gaze into the left corners of your eyes. Try to stack your shoulders, and lengthen through your spine as you draw your belly in. Stay here for five breaths. Then come back to Down Dog and repeat this pose on the left side. If you love yoga, you're not alone. Meet other yogis in the Yoga Stretch and Tell community group.